YSL Residences site is positioned between Gerrard Street West & Yonge Street. The Project with approx. 100,000 sq ft of retail, 186,000 sq ft of office, and 1,106 residential suites above in 62 and 73-storeys towers. 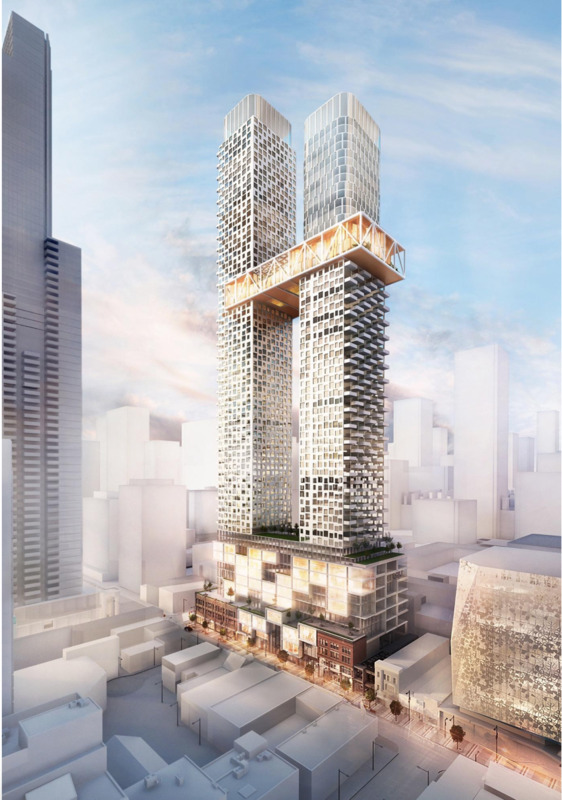 51st and 52nd-storeys sky bridge to link the towers 580 feet in the air. fit of luxury amenities. YSL Residences Condos features 2,212 square metres of indoor and 909 square metres of outdoor amenity space, located in a variety of places across the building: above the retail podium, at the 10th floor surrounded by the terrace townhomes, the 9th floor terrace, the top of the north tower, and along the sky-bridge. YSL Condos the residential towers cater more to the working professional, with 648 (59%) one-bedroom and 107 (9%) studio units; the remaining space is allocated in a more family friendly manner with 241 (22%) 2-bedroom and 110 (10%) 3-bedroom units.